Prove your worthiness to Boethia in the Tournament of Ten Bloods. Once you have reached level 20, talk to Haekwon at the Shrine of Boethia to find out about the gruesome offering Boethia requires. 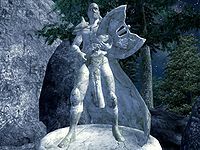 Acquire and offer one Daedra Heart to Boethia and travel to the Planes of Oblivion to participate in an interplanar tournament. Win the tournament, and return to the Shrine of Boethia for your reward. Travel to Boethia's Shrine, located southeast of Cheydinhal in the Valus Mountains. Speaking to Borba gra-Uzgash in Cheydinhal about "Daedric Shrines"
Speaking to Ulene Hlervu about "Cheydinhal"
Why do you summon me? You are not one of my faithful. Do you hope to be counted among my Chosen? Then prove yourself to me, mortal. I shall open a portal for you to one of my realms in Oblivion. Go, and take your place in my Tournament of Ten Bloods. Survive, and you will be rewarded. Fail, and your soul belongs to me. 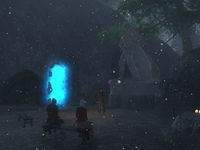 After the dialogue, a blue portal will appear nearby. When you are ready, activate it to be transported to the arena. 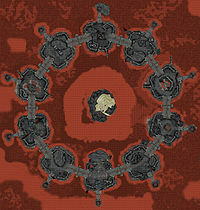 You will arrive in the stadium where the Tournament of the Ten Bloods takes place. You'll need to be prepared to fight nine rounds against Boethia's Chosen, one at a time. Be prepared; these characters are armed to the teeth with dozens of potions, weapons, powerful ranged attacks, and will often heal themselves. You will be unable to leave until all of them have been defeated. While you're battling, watch out for the lava: there's no fence to protect you (but you can certainly feel free to use this to your advantage by chasing your enemies into the lava). When you are ready to fight the next opponent, approach the gates to the right. These open before you reach them, so be prepared. Unlike the gladiator battles in the Arena, there are no rules about looting the corpses of your fallen opponents. Make sure you pillage the bodies of the fallen for some nice leveled weapons, enchanted arrows, armor and tons of potions. You don't have to pillage until all battles are completed because the corpses never disappear. When you have defeated your final opponent, a portal appears back to the realm of Cyrodiil. Activate it to return to Tamriel once you have looted the corpses of your opponents to your heart's desire. If you want to bring back more items than you can carry, pile them up by the entrance and pick them all up when you decide to leave. You can still travel through the portal if you are overencumbered. Approach the shrine and activate it. Boethia will congratulate you on your victory and reward you with a wonderful enchanted sword called Goldbrand, with huge damage along with a 22 fire damage per hit enchantment (regardless of player level). I greet you, Chosen One! A victory in my Tournament of Ten Bloods brings great honor. Take Goldbrand, sheathe it in your enemies, and offer their souls as praise to me. If you approach the war gate to the left, the enemy behind it will notice you and try to attack. Eventually they will fall in the lava trying to reach you and die. Boethia will announce their death and because it was out of sequence the remainder of the gates won't open. To complete the quest, jump around the other gates to fight the remaining opponents. When they are all dead the quest will continue as usual. 20 Boethia has told me that I am to participate in the Tournament of Ten Bloods. 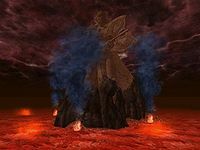 When I am ready, I should enter the nearby portal to Oblivion, and I will be sent to one of his realms for the battle. 30 I have defeated all of Boethia's followers in the Tournament of Ten Bloods. I should speak once more with the Daedra Lord. 100 Finishes quest Boethia was pleased with my performance in the Tournament of Ten Bloods. He has rewarded me with the enchanted sword, Goldbrand. It is possible to use the console to advance through the quest by entering setstage DABoethia stage, where stage is the number of the stage you wish to complete. It is not possible to un-complete (i.e. go back) quest stages. See SetStage for more information. This page was last modified on 1 September 2018, at 23:59.